Walking horseback in the Crimea. Beautiful sea, sun and warm mischievous sand, it would seem that still need to enjoy your summer vacation. However, if you go on vacation for a couple of weeks, then the sea very quickly get bored and want to visit beautiful places, interesting excursions and unusual entertainment. 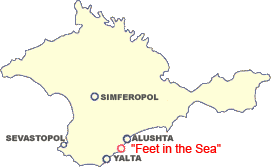 Crimea - is an amazing resort destination that has not only all of the above advantages, but also a great cultural heritage. After walking along the promenade, visit the tour and ride on a yacht and a parachute, it becomes a question of what to do in the remaining days of rest? 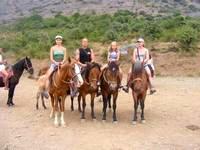 An excellent option are horseback riding in the Crimea - a rather unusual, but memorable pastime for the beauty of the resort peninsula. Once the horses were a necessary means of transportation, but now these noble animals have become friends of man, which helps restore lost power and the rest from the monotony of everyday life and bustle of the city. When meeting with an animal, it is better to establish spiritual contact. 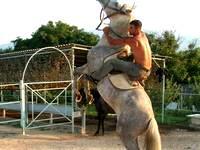 To do this, slowly approached the front or side of the horse and pet her. The main rule - it's not running up from behind, because a horse can get frightened and run away at best. 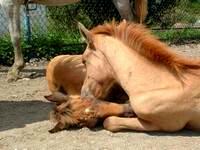 Respectfully referring to the animal, and can win his respect, which will make horseback riding in the Crimea as comfortable, so the main thing - is to make contact. Before you walk by experienced instructors will teach a few tricks in dealing with horses. And the next time you visit the Crimea, horseback riding will be an indispensable element of the active recreation programs. 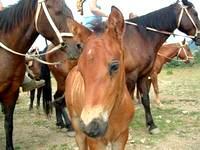 Being at sea vacation, horseback riding in the Crimea will be an excellent exercise to change the situation. Sunny beach views and sea breeze will be replaced by a pleasant woodland walk, which will help attain peace of mind. 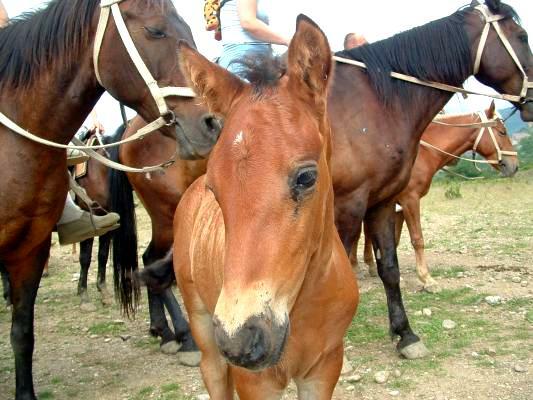 Horses - it's very quiet animals, so the horse walks in the Crimea are slowly and gradually, allowing you to consider in detail the beautiful mountain and forest scenery. 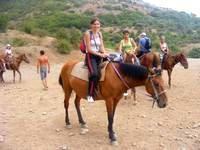 Before the holiday is possible to provide horseback riding in the Crimea, and stock up on essential clothing. Best fit jeans and a dark jacket with long sleeves, as the possible route through the forest, and protect themselves from mosquitoes. You can also wear a tracksuit, but it should not be bright and rustling, as too much contrast and "noisy" outfit can always distract the horse from the road. As for shoes, then you should choose comfortable shoes that do not contain iron rivets that can bray. 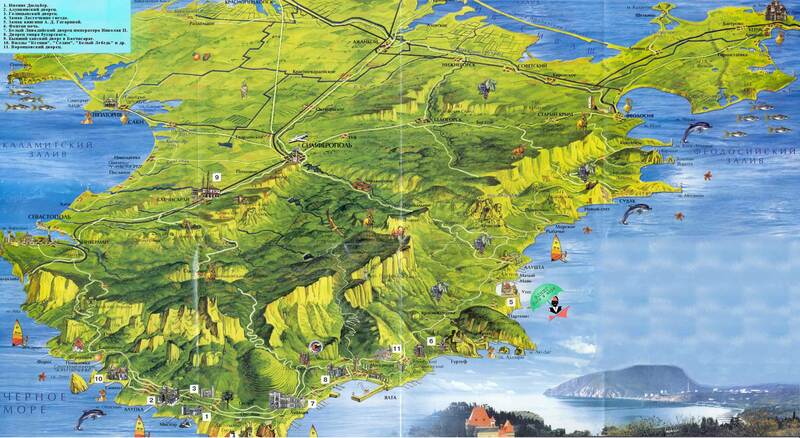 If you are a tourist, even with the experience, then after walking passed the whole of the Crimea, horseback riding will be the new format of the contemplation of beautiful places, but they need to pick a different shoe. Would be the best cavalry boots with small heel, but it is now hard to find. You should also choose footwear that has a small corrugation base, since it helps if necessary (eg when dismounting) without any problem to remove the foot from the stirrups. Guided horseback in the Crimea are ideal for people who have often been on the peninsula, and saw all the fascinating places - Swallows Nest, Yalta Botanical Garden, Livadia Palace and others. Of course, you can not see all the great places, but every time you want to experience something new in such a wonderful vacation spot, as the Crimea. Horseback riding will be remembered for a long time, very exciting and will enhance the internal tone. Only after such a pastime you can proudly say: "The rest was a success!". horseback riding in the Crimea in 2019.